Jumping rope is one of the most effective exercises for burning calories and toning muscles. Only jogging or swimming burn more calories, and jumping rope can be done in the privacy of your own home. 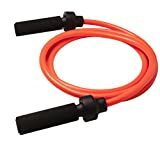 But there are specialty jump ropes as well, to optimize your workout. There are speed ropes, and weighted ropes. Speed ropes are more for developing speed and quickness in jumping rope, as well as developing coordination. They have special ball bearings in the handles so the rope goes around more quickly. But a weighted jump rope is designed to burn more calories, to lose weight, and to increase muscle strength. You add weights to the handles, in increments of pounds. This compels your arm muscles to exert themselves on each revolution. The jumping action also develops muscles in your shoulders, back, chest, abdomen, buttocks and calves. If your goal is to increase weight loss or arm strength, then a weighted rope is for you. 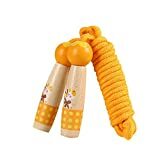 Beaded jump ropes--There are jump ropes that are composed of segments. By adding more segments to the rope, you increase the rope’s weight. This is also a method of making a weighted jump rope. Valeo makes such a beaded jump rope. Weighted handles--These are jump ropes where you add weights to the handles. The weights are in increments of 1 pound, ranging from 1 to 6 pounds. Laxwin makes a jump rope with weighted handles (although not up to 6 pounds of weight). Alternating ropes--Cross Rope makes a jump rope where you vary the rope itself. They sell a range of thicknesses of ropes, with each rope weighing more than the previous level. That also trains you to exert more energy and burn more calories. 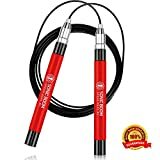 Digital jump ropes--These are jump ropes that have an LCD display in handles. It can tell you the number of revolutions that you have performed with the jump rope. Enkeeo makes a digital jump rope. 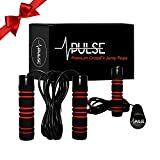 Cordless jump ropes--There are even jump ropes that don’t have any rope! They have a weight, or “gravity ball”, on each handle. As you rotate the gravity ball, a counter counts the number of revolutions. There is no cord to get tangled, and you don’t get struck by the cord accidentally. Leather versus metal rope: A leather rope has the advantage that it doesn’t scratch the floor if it hits the ground. A leather rope can also be adjusted to the correct length easily. But a metal rope is more durable when jumping on a hard surface, such as asphalt. 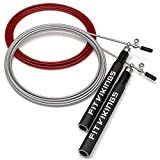 The LAXWIN JR01 Adjustable Weighted Jump Rope is made from metal, coated with rubber or plastic, so it combines durability with a soft exterior. Adjusting the length of the rope is done by cutting it to the proper length. 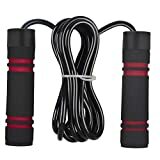 Cardiovascular benefits: Besides the weight loss and muscle tone benefits of a weighted jump rope, people also noted the benefits to your heart and lungs. Getting your heart to beat more conditions it to pump more blood during each heartbeat. 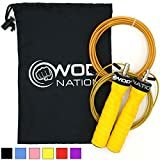 Heavier ropes allow you to add coordination: Since you’re able to time your jump more, using a heavier rope, or heavier handles, is actually a way to teach yourself to jump with more agility, and thus increase speed as well on the lighter ropes. Start out with a light weight: You insert the weights into the handles of the jump rope in increments. Usually the weights will go up 1 pound at a time, from 1 to 6 pounds. You should start with a 1-pound weight. When you notice that it doesn’t tire your arms out anymore, go up to the next level. Rubber handles: It’s good to get soft foam rubber handles, because they tend to be easier on the hands. Wood may cause callouses with extended use. Great for children as well: They may not need the conditioning from the weighted handles, but jumping rope is a good method of improving a child’s coordination, as well as inducing them to stay in good shape. It also enables them to gain rhythm and flexibility. WODready--is located in Lufkin, Texas. 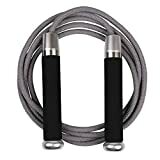 They make fitness products, including a muscle roller stick (that relieves soreness, muscle cramping and tightness), a foam roller and massage ball (to relieve muscle tension and soreness), and weighted and speed jump ropes. PowerGuidance--are makers of exercise products. 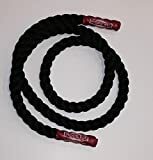 They make pullup assist bands, powerlifting bands, hand grips, barbell clamps, weightlifting belts, exercise mats, medicine balls, speed and weighted jump ropes, and more. DigHealth--are makers of health and fitness equipment, including jump ropes, cycling equipment, blood pressure monitors, and more. LaxWin--are makers of sports, fitness and outdoors equipment. 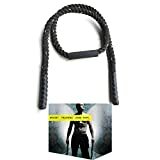 Their products include weighted jump ropes, tactical pens, hand strengtheners, sleds, and more.